Soaps with a purpose. Each of these soaps is formulated to do more. Our Cinnamon Hazelnut Kitchen Bar has finely ground fresh coffee beans added to remove strong kitchen smellls like garlic, onion and fish from your hands. 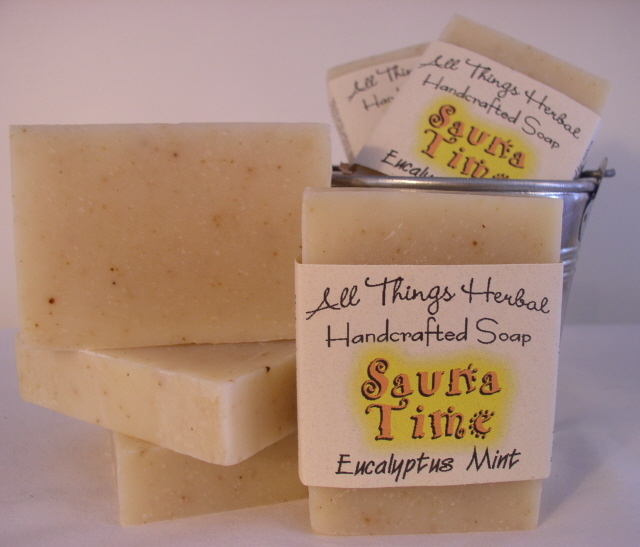 Scented with the warm spicy essence of cinnamon sticks with hints of ginger and clove. Both Kitchen Bars have copious amounts of Olive Oil for an extra emollient soap with a rich creamy lather. Delicately speckled with poppy seeds, our Lemon Verbena Kitchen Bar is perfect for those who enjoy the sweet and refreshing scent of lemon. Lemon Verbena is an herb where the long, shiny leaves have a citrus like scent and taste and are used in teas, iced drinks and jellies. We've taken lemon verbena, lemon zest, poppy seeds and finely ground cornmeal and combined them into a unique bar that provides gentle scrubbing to help keep cooking hands clean and fresh. A naturally healing and antiseptic soap to be used on rashes and minor cuts or scrapes (great in kitchens and daycares as a natural germ busting hand soap) and for acne prone skin. This soap is a must have for teenagers since tea tree is naturally antibacterial & anti-fungal it works wonderfully for problem skin. Great deodorant bar too! Specially formulated using soothing aloe vera together with neem and tea tree essential oil for their antibacterial and antifungal properties. 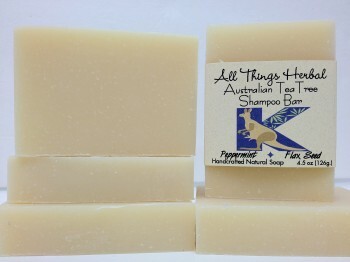 Tea Tree Shampoo Bar - A delightfully tingly, fresh smelling shampoo bar with pure essential oils of tea tree and peppermint. Great for scalp circulation and beneficial for all hair types. Especially helpful for scalp conditions. With plant oils of castor, jojoba, avocado and organic flaxseed that give the shampoo bar incredible lather and superior conditioning ability.Nourishes hair and scalp and leaves hair soft and shiny without stripping hair. 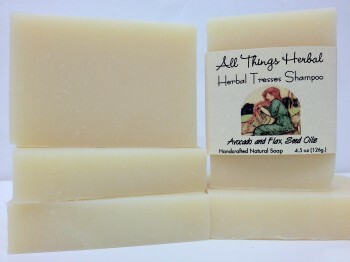 Herbal Tresses Shampoo - A fresh, herbal, clean-smelling shampoo bar made with specialty oils of Avocado and Shea Butter that nourish and clean your luscious locks. Super mild and nonirritating, Herbal Tresses conditions as it cleans. Perfect for all hair types. With plant oils of castor, jojoba, avocado and organic flaxseed that give the shampoo bar incredible lather and superior conditioning ability. Nourishes hair and scalp and leaves hair soft and shiny without stripping hair. Our herbal infused vinegar hair rinse is a cleansing, conditioning and softening treatment to be used with one of our natural shampoos. Don't let the word vinegar scare you - vinegar has an excellent reputation for cleansing and restoring, while providing essential antibacterial properties. It's rejuvenating properties help to prevent bacteria growth, itchy, flaky scalp, and hair loss. It removes detergent and calcium residue and helps restore the natural pH balance of your hair, leaving hair soft, shiny and beautiful. Vinegar closes the cuticle which opens when we shampoo our hair. When the layers of the cuticle are tightly knit together, the light is able to reflect off the cuticle, making your hair shine. And finally, vinegar has a tonic action that promotes blood circulation in the small capillaries- helping bring nutrients and oxygen to the scalp. Use twice a month, more often while switching shampoos. Use throughout hair, massage into scalp. You may rinse it all out or leave the rinse on your hair. I rinse a little, one quick spray of water. Leaving the vinegar rinse on your hair helps prevent tangles in long hair. Since the vinegar restores natural pH balance it also helps prevent an itchy scalp. As your hair is drying you will smell vinegar, but once your hair is dry, no smell. 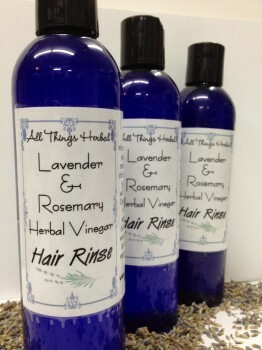 Ingredients: White wine vinegar infused with lavender, rosemary and sage and lavender hydrosol. 8 fluid oz. Our Sauna Time Bar transports you from an ordinary hot shower to the relaxing experience of a spa sauna. Two supremely complementary scents become one fragrant delight in this minty eucalyptus bar. To make the experience even more memorable we add a touch of rosemary, orange and pine essential oils to create a perfect blend. Crushed rosemary gives the bar its speckled natural color. This beautiful soap, enriched with shea butter, hydrates and cleanses your skin to leave you feeling healthy. 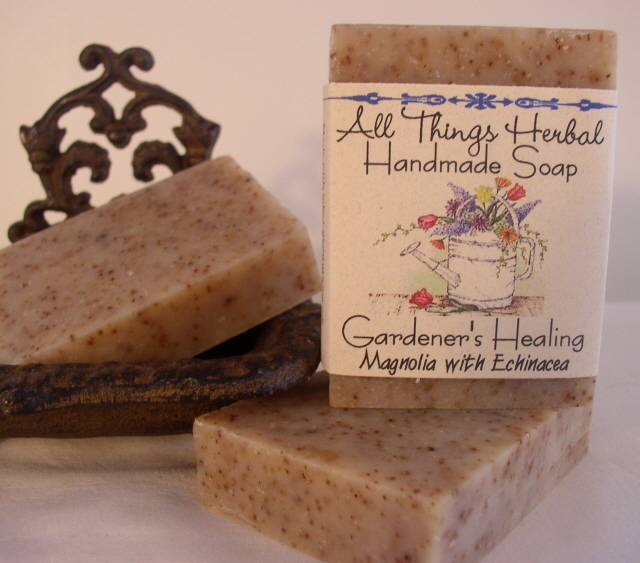 A great soap for the cold season and allergy sufferers. Featured Ingredients: Spearmint is uplifting and may even soothe a headache. Australian Eucalyptus is anti-viral, and as an anti-inflammatory, refreshes your paranasal sinuses. For a homeopathic decongestant or a thrilling morning shower, this soap will satisfy. Our Gardener's Healing Bar is filled with natural ingredients that nourish and protect your skin. Healing echinacea together with honey, soothes and softens skin while natural jojoba granules and poppy seeds gently scrub away impurities. Shea Butter and Oilve Oil help restore moisture lost to the skin while working in the garden. Simple Ingredients, Extraordinary Benefits: cold-process soap made with select moisturizing oils you and your skin will love - Olive, Coconut, Palm Kernel, Sunflower, Cocoa Butter, Shea Butter. Special Additions: Honey, Echinacea Root, Jojoba Granules, Poppy Seeds. A melodious blending of mint essential oils, our Gardeners' Scrub Bar soothes and refreshes, while Shea butter and olive oil help restore moisture lost to the skin from working in the garden. 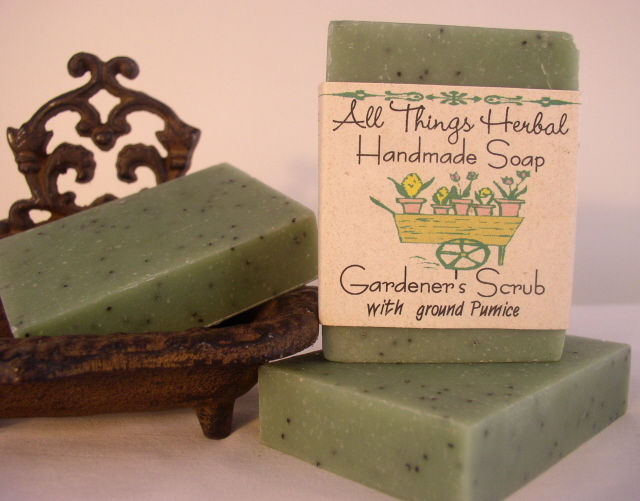 Filled with natural ingredients that scrub working hands clean; cornmeal, poppy seeds and finely ground pumice. Simple Ingredients, Extraordinary Benefits: cold-process soap made with select moisturizing oils you and your skin will love - Olive, Coconut, Palm Kernel, Sunflower, Cocoa Butter, Shea Butter. Special Additions: Peppermint, Spearmint, Wintergreen, White Cornmeal, Poppy Seeds, Pumice. 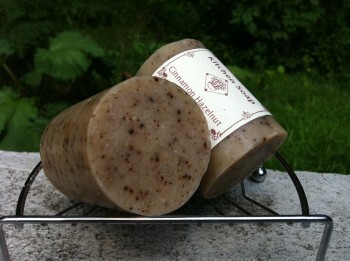 The one, the only, traditional lye soap made to stop the spread of poison ivy or oak. Living in the northwoods of Minnesota, as soon as a family member thinks they may have been exposed to poison ivy, we wash with our poison ivy bar of soap. Usually, this will do the trick and we will be fine. If a rash does appear we do two things. Continue washing the affected area with our soap and leave the lather on the affected area to dry. 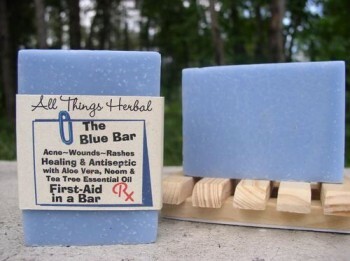 The clay in the soap lather helps calm the rash and makes it itch less! 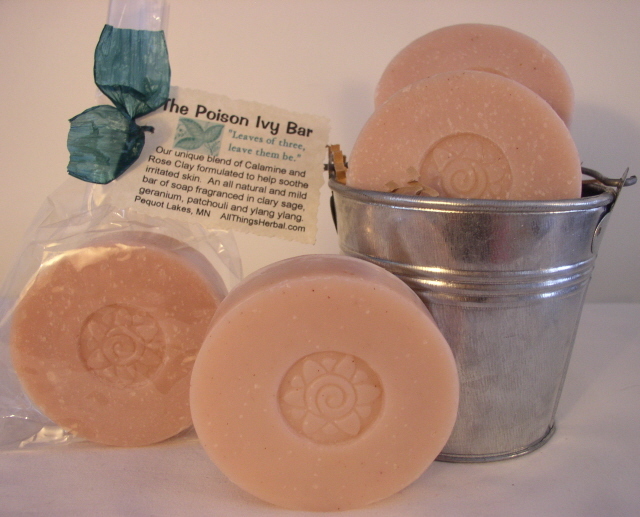 Our Poison Ivy Bar is an all natural soap made with shea butter for extra skin soothing properties, our special blend of Calamine and Rose Clay formulated to help soothe irritated skin and scented with clary sage, geranium, patchouli and ylang ylang. 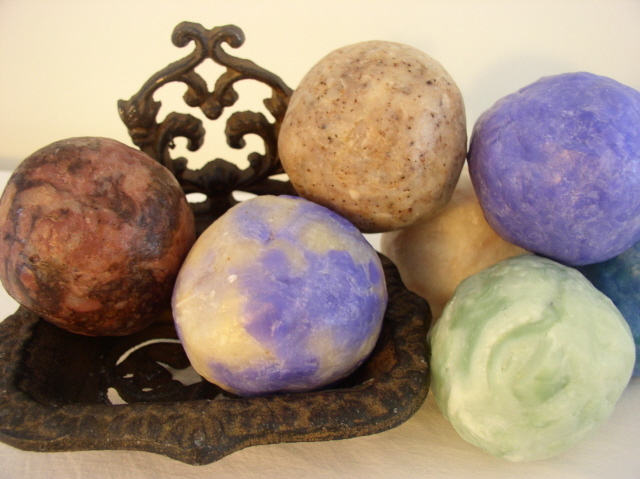 This is a 100% natural soap with no petrochemicals and may be used for fresh water bathing. 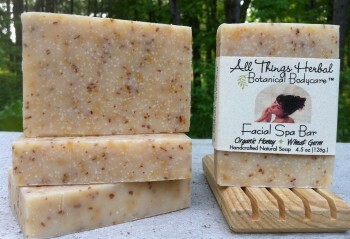 Our Organic Honey & Wheat Germ Facial Spa Bar is filled with natural ingredients that gently clean and nourish your skin. Wheat germ and Kaolin clay for gentle exfoliation that revives dull skin and leaves you with a radiant glow. Honey and nutrient-rich Shea Butter to moisturize and repair the skin. These extra emollients work together to hydrate, nourish and restore the skin and make your complexion newly radiant. We looove this soap as a facial cleanser. All types of skin seem to respond extremely well. A gentle soap that cleanses and removes all impurities from the skin, leaving it soft and comfortable plus a nourishing cleansing bar. For daily use with normal to dry skin. 4.5 oz. Treat yourself with natural botanicals and enjoy the benefits these facial care delights offer. Tea Tree & French Green Clay Facial Spa Bar a luxurious, detoxifying facial soap with Tea Tree & Lavender Essential Oils and purifying French Green Clay. 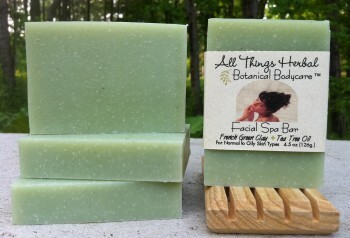 The perfect facial soap to use for quick detox, improved circulation, even skin tone, cleansing and oil control. While our clays are quarried in France, natural clays have been used in bath products since roman times for their purifying, stimulating and toning properties. Our Green Clay Facial Spa Bar uses the detoxifying power of clay to clear your pores and restore lost moisture and tone, giving your face a radiant glow. 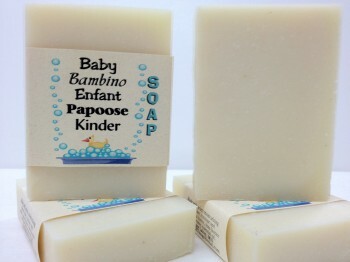 Our Lavender Baby Soap is a100%Natural Pure Soap. A baby's skin is so soft that it deserves the most gentle of soaps. Infused with Lavender Essential Oil for newborn baby skin, and for those who want the gentlest baby soap and a soothing scent. Lavender will both calm and delight your spirits. We make our Lavender Baby Soap differently than our other soaps, and we make it specifically for a baby's sensitive skin or for those with sensitive skin or with special skin needs. Formulated with extra shea butter and olive oil, the bar is pure white. The gentleness of these oils and their ability to act as a humectant and draw moisture from the air to your skin makes this bar wonderful to use. The bubbles are silky and plentiful. Simple Ingredients, Extraordinary Benefits: Cold-process soap handmade with moisturizing oils you and your skin will love ~ saponified olive, coconut, palm kernel, soybean, sunflower, cocoa butter, shea butter, 100% pure Lavender essential oil. Enjoy a bit of nostalgia from yesteryear. Handmade laundry soap with Borax and Washing Soda ~ natural laundry boosters. Rub the soap on tough stubborn stains or grate some into your wash water. Scented in Fresh Breeze, these crinkle-cut bars are tied with assorted gingham fabric and a wooden clothes pin. Named after Christine's Grandma Marie Jentsch who made laundry soap for her family. A great way to stock up! A whole pound (4 bars) of handcrafted natural soap at a great price. Our Odds and Ends pieces are seasonal or experimental scents, discontinued, dinged or otherwise less than perfect soaps. Scents will vary based on what we have available at the time of purchase, though if you want to sample a particular soap, let us know and we'll add it if possible. 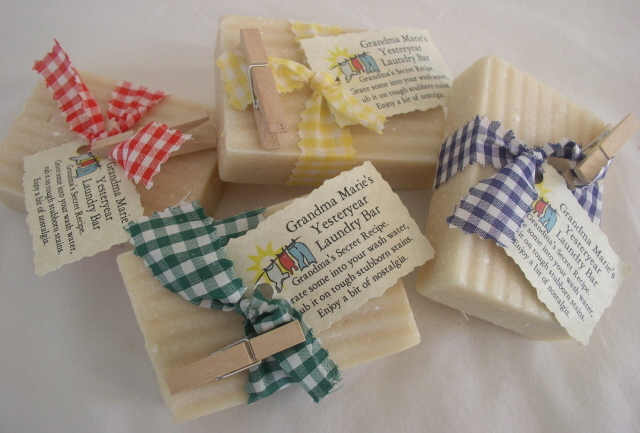 Soaps are labeled and come wrapped in tissue inside a green gingham bag. These are the soaps that we use on a daily basis. Ideal for scenting drawers and closets or fill a basket for your bathroom.